There's no doubt about it: The fact that a bat is the unofficial mascot of our town is a clear indication that we like to keep it weird here in Austin. The strange thing is, if you ask around, many of us Austinites have never seen the bats or haven't tried in years. So why not make this summer the time you see our favorite winged mammal? Sit on the lawn or stand on the bridge. The easiest thing to do is to pack a picnic and head down to the Statesman's Bat Observation Center in the northwest corner of the parking lot at least an hour before dusk. Street parking is available nearby, and there are several parking lots, as well, which are a bit of a longer walk. There is signage to tell you more about the bats, and you'll be surrounded by many other families doing the same thing. You can read more about this option here. If you have older kids who don't mind standing for longer periods of time, you can find a spot on the southeastern part of the bridge about an hour before dusk. The best part is that these options are both free! Take a boat tour. Capital Cruises and Lone Star Riverboat both offer public sightseeing cruises that are about an hour in length and cost $10 per adult and $5-$7 for kids. Departure times vary slightly, depending on what time of year it is, and you do need to arrive a bit in advance. Compared to hanging out on the ground, this is a little more comfortable, and you can usually snack on the boats while you listen to the guide tell you more about different spots along Lady Bird Lake. If you have kids who have a hard time sitting still or who have a daredevil streak, this option might be too stressful to be worthwhile. You can read more about this option here. Canoe or kayak to the bridge. If you have your own canoe or kayak, you can get up close and personal with the bats, along with anyone else who has the same idea. Several vendors rent canoes, kayaks and paddleboards near the bridge. 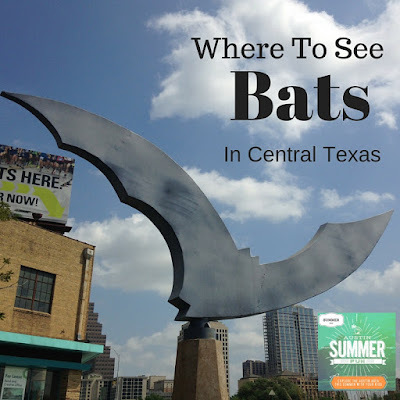 You can also book a bat tour with the Texas River School, which hosts a monthly Moonlight Bat Float, complete with music from local musicians, and it benefits the nonprofit's work to take at-risk kids for adventures on the water (read more about that here). Live Love Paddle also hosts bat tours. Enjoy the view while you eat. The north side of Lady Bird Lake has several hotels with restaurants that claim to have the best bat watching. One casual option is Alta's Cafe, which is located atop the Waller Creek Boathouse. There are a few piers along the north side of the lake that also offer a great vantage point to see the bats. Round Rock. Nearly half a million bats emerge from a spot close to the intersection of IH-35 and McNeil. Head to 601 North Interstate 35 Frontage Road in Round Rock with your blankets and something to cover you in case of any guano falling from the sky. Free parking is located nearby. Bracken Cave. Austin may be the largest urban bat colony, but Bracken Cave, located half an hour northwest of San Antonio, is the location of the largest bat colony and one of the largest concentration of mammals on Earth. In 2014, the cave and land surrounding the cave came under the management of Bat Conservation International. Members have the opportunity to visit the cave certain times each year and the public can sign up for a few nights (note 2017 is filling up fast). Eckert James River Bat Cave. The Nature Conservancy manages the Eckert Cave, which is about 16 miles from Mason, Texas. Tours run from Thursdays-Sundays from mid-May until early October. Some sunrise viewings of the bats returning from their nocturnal hunts are also offered. Old Tunnel State Park. On Thursday through Sunday evenings, from May through October, visitors ages 4 and up who pay admission can view more than 3 million bats emerging from an abandoned railroad tunnel near Fredericksburg. Bat-viewing opportunities are available seven nights a week, and nightly educational presentations are given Thursday through Sunday. Thanks to Austin Diagnostic Clinic for sponsoring this post. With four Pediatric offices in Central Texas, The Austin Diagnostic Clinic also offers primary, specialty and urgent care for adults too! For more information, or to make an appointment contact our 24-hour call center at 512-901-1111 or visit ADClinic.com.